Spokane's Fire Station No. 3 with its apparatus and staff in the 1930s. 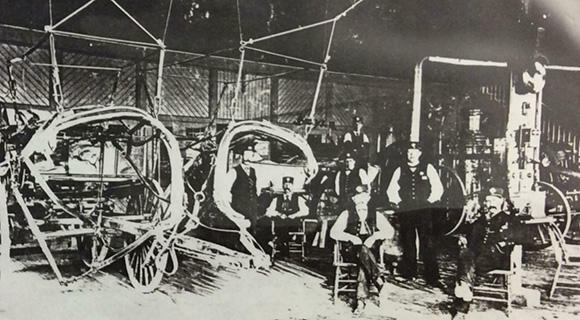 The early professional firemen in Spokane used horse-drawn carts. Between fires, the harnesses were suspended mid-air so the horses could be placed quickly, attached to the carts, and off to the fire. Fire Station No. 3 was first housed where the County Courthouse now sits, then moved to a wood building at Monroe and Sharp around 1895. But things got exciting for the men of No. 3 in 1912, when the city Fire Department got a new Chief. Albert "Boomer" Weeks loved to design vehicles using the new gasoline engine. With the city leaders' blessing, Chief Weeks had a machine and paint shop built behind Station No. 3, facing Sharp Ave. The firemen used their chief's designs to create a fleet of fire trucks. Standard pieces were built, painted and stored in the upstairs section, then assembled on the ground floor machine shop. When not fighting fires or attending to their other duties, the firemen could assemble a ladder truck or chemical engine in three weeks. 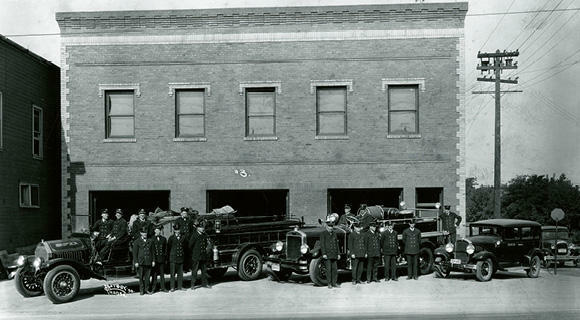 The machine work in the building on Sharp revolutionized the Spokane Fire Department. Within four years, the firemen had retired their horses and old coal steamers in favor of gas-powered vehicles. The old wood building next to the machine shop was obsolete, and the city replaced it with a new station to match the important machine shop. The replacement still faced out onto Monroe Street, with three large bays to hold the ladder and pumping trucks. Men continued to live in the upper level, sliding down the brass poles when a call was made. Fire fighters who lived and worked in the building from the mid-1970s through 1991 told SPR what life in the fire station was like. Listen to their stories here. When the fire department left Fire Station No. 3 in 1991, two brass poles were cut off at the top, as seen during a pre-renovation open house, and a third was removed. SPR restored these historical features, and kept these wooden fireman lockers seen on the far wall. In 1991, the city moved the men of No. 3 to a modern facility not far away. The location became a commercial building and was up for sale when SPR searched for a new space for studios and offices. Renovation began in June 2014, retaining or restoring several key elements of Fire Station No. 3. See a tour of the Fire Station as SPR's Home.